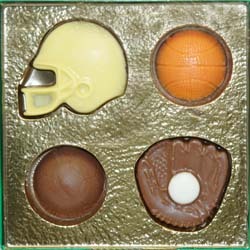 The perfect gift for the sports lover, this solid chocolate, hand-painted gift pays homage to sports balls of four kinds. Because our moulds are hand-painted, each is unique. Color and design will vary.